The example below shows only one required field (Cardholder Name/UMname). Remember to replace UMname with the field you would like to require and Cardholder Name with the customer facing field name for the error message. Add this function for when you are using multiple fields with the same ID (ex, UMname). This will be useful for a payment form that gives the customer an option of paying with two different payment methods: credit card or check. This way each section can have its own UMname field. The example below shows the required fields (Cardholder Name/UMname, Card Number/UMcard, and Card Expiration Date UMexpir). 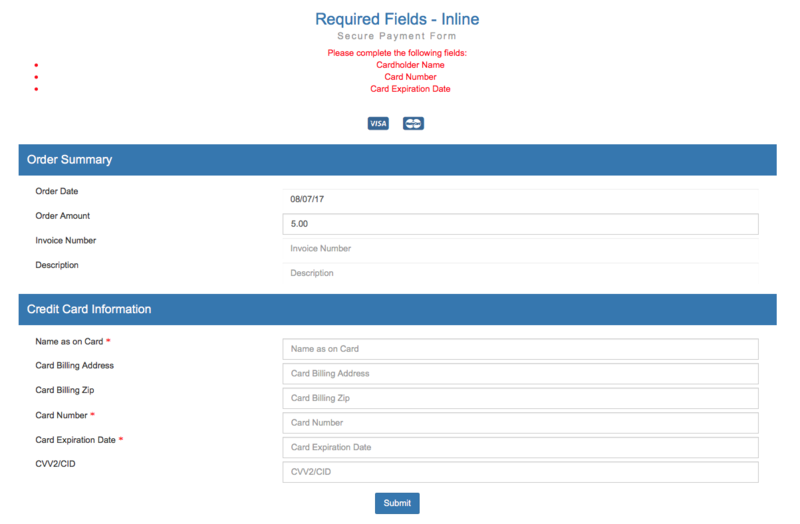 Remember to replace UMfields with the field you would like to require and the customer facing field name (like Cardholder Name) with the fields you would like to require. <font size="2" face="Verdana"> indicates a required field. Create red *'s for each required field.